Our client in Virginia water, Surrey had suffered a nightmare situation with a previous landscaping company. The workmanship was so poor that it needed to be totaly ripped out and the lack of drainage meant that the newly decorated house became flooded as a result.Do you know anyone who has suffered this kind of nightmare?We were able to write a report (to be used in court) to help our client get some of their hard earned money back. 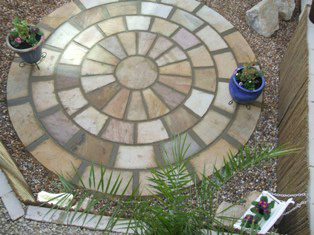 We did this for only £35.We then landscaped their garden as it should of been done in the first place.The image shows a sandstone circle as part of the project. Notice it’s set in shingle providing additional drainage.